Three standard rooms overlook the historic center, spacious and bright. 3 rooms with views looking towards the valley with vineyards and olive groves and the sea of Sardinia, 3 in the heart of the garden have a comfortable courtyard; 2 superior and 2 junior suites, with terrace or balcony, view enclosing the sea and the coast of Bosa, 1 large suite overlooking the area, living room with sofa bed and separate sleeping area. Old House in the 3 basic, characteristic for ceilings in wood and reeds, with private bathroom with shower, safe but without air conditioning, minibar and TV. 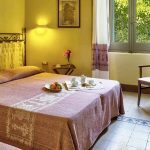 All rooms of Villa Liberty has a private bathroom with shower, toilet, bidet, sink and hairdryer air conditioning service, satellite TV, minibar, safe and free internet access. Some rooms have whirlpool or sauna, and terrace for breakfast and tea time. If you want more intimate hospitality, for you the holiday residence formula: the junior suites and suites have a kitchenette equipped with all the necessary equipment.